The pelvis is made up of a ring of three bones, the two iliac bones and the central sacrum, sandwiched in-between. In the front of the pelvis, the pubic symphysis attaches the ilium bones to each other. This pubic symphysis joint is very immovable due to heavy fibrous tissue joining these bones in a configuration called a syndesmosis. In the back of the pelvis, the area where each ilium bone joins the sacrum is called the sacroiliac joint (SI joint). The sacroiliac joints are mirror images of each other. These joints are unusually complex in that they are made of two different types of joints combined into one. The rear and inferior portions of the SI joint contains a tough fibrous section similar to the pubic symphysis. This portion of the SI complex binds the pelvis together. These tough fibrous bands prevent most motion. The front and superior portion of this joint has some aspects of a regular joint like the hip and knee and is called the diarthrodial portion of the joint. Normally diarthrodial joints are designed to slide against each other without friction. The major difference in the diarthrodial sacroiliac joint is that this joint is made of two opposing bony surfaces that are irregular and interdigitate together-preventing motion. The surfaces of this joint are covered by hyaline cartilage (the same substance that lines hips and knees) and have a thin capsule that encloses this cavity. The capsule is lined with synovial tissue-the tissue that makes the lubrication for this joint. The SI joint does not act as a typical joint like a hip or knee. There are no “gliding surfaces” like you would expect but a solid interlocking interface between these two bony surfaces. Unlike any other synovial joint in the body, global SI joint function is designed to bond the pelvis together at the rear to make the pelvis a relatively rigid ring. This joint has about 1-2 degrees of total motion (in comparison to the knee joint which has 120 degrees of motion). The SI joint does change with age. In infants, this joint surface is smooth. As the body ages, peaks and valleys grow until the joint fits like a jigsaw puzzle and has almost no motion. In just about everyone with aging, this joint becomes stiffer. Sometimes the joint actually fuses together by itself. In women, the sacroiliac joint is somewhat “looser” as women must be able to deliver the baby at the end of pregnancy through this tight pelvic canal. The hormone Relaxin which is secreted during pregnancy, loosens all ligaments in the body accommodating this loosening. In-office diagnosis of an SI joint pain syndrome is difficult in that there are no physical examination tests that can insure this diagnosis. These tests include the Patrick’s FABERE test, the Gaenslen’s Test, the pelvic compression test and the pelvic shear test as well as direct palpation of tenderness. These tests will be positive in most patients with SI joint syndrome but will also be positive in a number of other spinal conditions. X-rays are also generally not helpful for diagnosis. Many individuals have degeneration of the sacroiliac joint based upon X-rays and have absolutely no symptoms. Others with obvious SI joint pain from the joint itself have normal looking joints on X-ray. MRI scans can be more helpful to look for significant bone changes indicating abnormal loading and wear but even these images may not reveal SI joint pain generation. MRI is the gold standard for diagnosing ankylosing spondylitis and the seronegative spondyloarthopathies. A patient with an SIJ pain disorder should gain relief procuring a sacroiliac injection with an anesthetic (Novocain, Lidocaine, Marcaine), which should numb the joint and temporarily rid the patient of pain. This is called a positive diagnostic block and is the mainstay for diagnosis of this disorder. The injection into the joint is normally accompanied by a corticosteroid, which can be effective for long-term relief and rarely yield a cure. Normally, two positive blocks are considered diagnostic. There is however, occasionally a problem with this diagnostic test. SI joint injections can inadvertently anesthetize the sciatic nerve if there is a joint capsule tear of the anterior joint. The sciatic nerve sits directly in front of this joint. With a tear of this joint capsule, injected fluid can leak out in front and contact this nerve. If the sciatic nerve is contributing to SIJ regional pain (from a herniated disc for example), pain will improve from the SIJ injection but the wrong conclusion might be drawn (a false positive test). The doctor might think pain relief indicates an SIJ syndrome when in fact the pain is originating from the anesthetized L5 nerve root. Injection of an X-ray dye agent into the joint can reveal this tear. The dye will leak out the front of the joint and will be visible on fluoroscopy. This leak would allow the injectionist to note the tear and allow more information to be available to the diagnostician. Are you a candidate for sacroiliac joint fusion? If the patient has had a prior fusion to the pelvis with screws that cross the sacroiliac joint, removal of these screws can relieve SIJ pain and fusion of this joint may not be necessary. However, it is rare for a patient to have this present in the office. It is not rare however that a patient with a long fusion could eventually wear down the sacroiliac joint and present with pain. Patients with long scoliosis fusions to the sacrum are at risk for this syndrome. 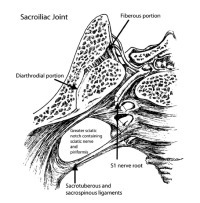 Also, with the older iliac crest bone graft donor site problems (the joint is inadvertently entered when the graft is taken), sacroiliac pain can occur. Sacroiliac joint fusion is the endpoint treatment for chronic SI pain syndrome. If the patient has failed all other therapies (nerve ablations, physical therapy and activity restriction) and has continued pain, surgery can be chosen. There are generally two types of techniques that have been recently developed. 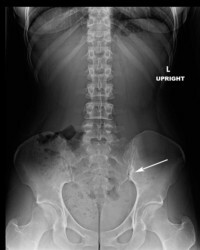 One technique is implanting three triangular bars or rods (SI Bone) with ingrowth surfaces through the sacroiliac joint. Bone grows into these bars on each side of the joint and the joint is stabilized. The other (Ziga Technologies) has a unique reamer that ablates the joint and allows implantation of bone growth factors (allograft, DBM or even BMP) directly into the joint. Then two large “screws” are driven across the joint to stabilize this articulation. In either case, the patient needs to avoid full weight bearing on the leg where the joint is located. This means using crutches or a cane on the surgical side for about 6 weeks. Generally, the pain is lessened or eliminated over that 6 weeks. The long-term success rate for sacroiliac joint fusion appears to be in the range of 70-80%. For additional resources on sacroiliac joint fusion, please contact the office of Dr. Donald Corenman, back pain doctor and spine surgeon serving the communities of Vail, Aspen, Denver and Grand Junction, Colorado. (Click to Enlarge Image) This is a back to front picture of the sacroiliac joint. The left side demonstrates the diarthodial portion (lined with cartilage) and the right side with the tough ligamentous portion. (Click to Enlarge Image) Top-down image of the sacroiliac joint. To the right is the sacrum and left is the ilium. You can see both portions of the joint (the diarthodial portion that is like the hip or knee joint and the fibrous portion which is stiff and unyielding. (Click to Enlarge) Left SI arthritis. Arrow points to the thickened bone associated with arthritis. (Click to Enlarge) SI injection. Small needle is directly in the joint. (Click to Enlarge) Back to front X-ray of SIJ fusion. You can see this patient had a prior multi level lumbar fusion which is associated with SI joint syndrome. (Click to Enlarge) Oblique X-ray of SIJ fusion. (Click to Enlarge) Lateral X-ray of SIJ fusion. Arrow points to the two screws fixing the joint.